Since this week is St Patty’s, I decided to get into the spirit and make a dish in honor of the day. Obviously, I had to incorporate the color “green” in the dish because it just wouldn’t be unique without it. Green Beer, Green Cake, Green Eggs, it gets very creative but I decided to go the healthy organic route and use natural green colors from vegetables and herbs. I would see a lot of lunch and dinner recipes out there but I rarely saw anything for breakfast. 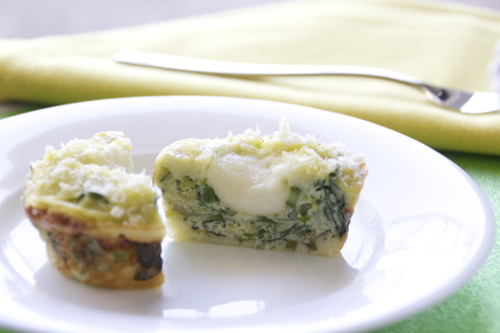 So what better way to celebrate St. Patrick’s Day then to have Breakfast Frittata! 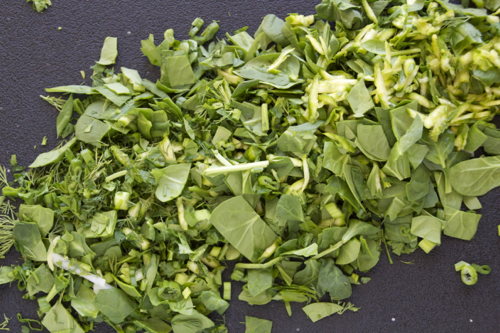 I have to admit, I went into my fridge and I just went digging around, taking out anything green. I laid out all my ingredients then I started eliminating and adding other things in. And my outcome was this amazing frittata that made my house smell so good! My mouth was literally watering when I was trying to get the perfect shot for these bites! I actually stopped shooting and had a piece of my own! All of the flavors from the ingredients go so well in this frittata. The oozing mozzarella ball in the middle is just amazing! And the salty crusty layer of Parmesan on the bottom is delish! This frittata will go really well with a nice Arugula salad and Mimosas when friends come over. 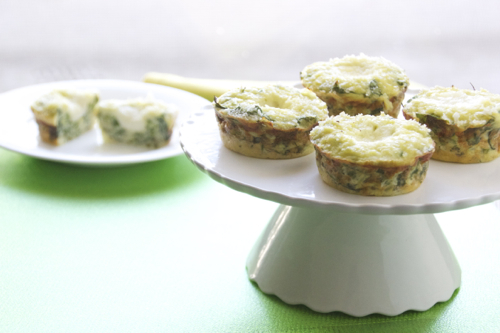 The perfect brunch dish and also lets not forget, the perfect St. Patrick’s Day breakfast! 2. Heat 1 tbsp of oil in a sauté pan over medium high heat and sauté your leeks and onions for 5 minutes. 3. Add the diced asparagus along with a pinch of salt and pepper and sauté an addition minute. 4. Place the mixture aside and allow to cool. 5. 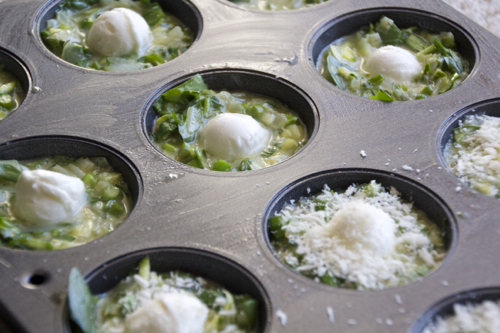 In a large mixing bowl, whisk the eggs, milk, garlic powder, salt, pepper and Parmesan cheese. 6. 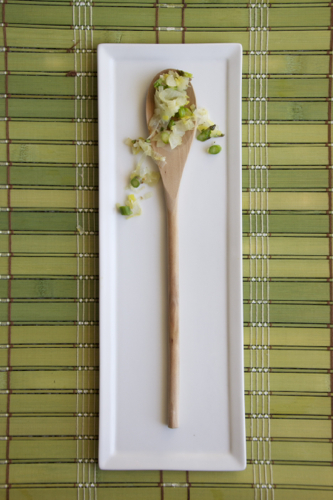 Add the grated zucchini, green onions, parsley, dill, spinach and the cooled onion & leek mixture and stir to combine. 7. 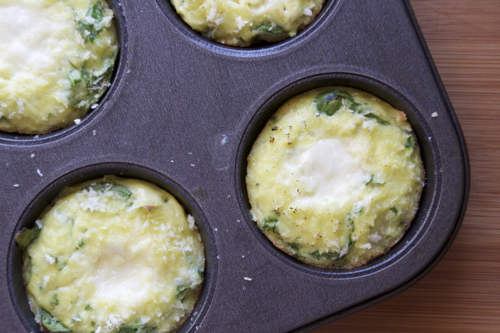 Spray your muffin tin with oil and spread 1 tsp of parmesan cheese on the bottom of each cup. 8. Pour 1/4 cup of the frittata mixture into each cup. 9. 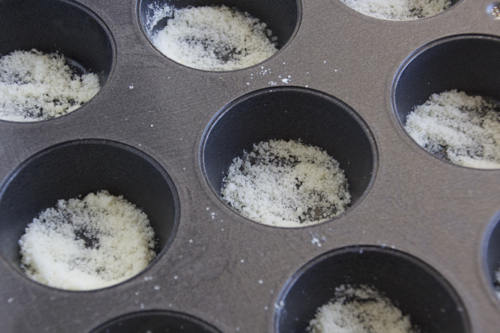 Place 1 mini fresh mozzarella ball in the center and top each cup with 1 tsp of panko bread crumbs. 10. Bake for 20-22 minutes until golden and cooked through. Alina!! This looks SOOOOOOOOOOOOOOOOO good!!!!! theme/design), I don’t have time to read it all at the minute but I have bookmarked it and also included your RSS feeds, so when I have time I will be back to read a great deal more, Please do keep up the fantastic work. Thank you for your sweet words! Comments like yours are my drive to keep this blog going and be successful! Thank you so much!